Leonardo Ponzio believes River Plate's players will forever be revered for beating Boca Juniors in the Copa Libertadores final. 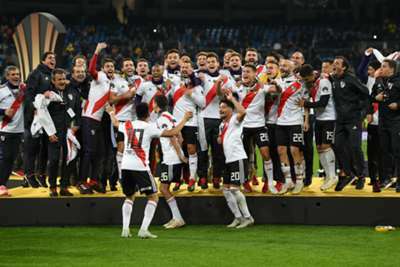 In a game that was delayed and then moved to Madrid following an attack on the Boca bus last month, River won the second leg 3-1 after extra time on Sunday to claim a 5-3 aggregate success that earned them a fourth Libertadores title. Ponzio acknowledged that this triumph in the Superclasico will bring lasting adulation for River's players. "Today's event is going to be remembered by many people," he said in quotes published on TyC Sports. "Many of us will be idolised for this." The River captain conceded the win was still sinking in immediately after the final whistle and dedicated the victory to the club's fans back in South America. "At this moment there are still many things going around, we still did not realise what we did," he added. "The people who stayed in Argentina deserved this and much more." River had been trailing on Sunday but Lucas Pratto's 68th-minute strike forced extra time, when the dismissal of Boca's Wilmar Barrios proved key as Juan Quintero and Gonzalo Martinez scored against the 10 men. Argentina international Pratto played for Boca earlier in his career but joined River prior to this season and he was delighted to win the Libertadores so soon. "At the beginning of the year I said that I was coming to win the cup and in a year I got it, against the biggest rival of the club," Ponzio said. "We made history, we are very excited, we cannot believe it."